What God does here is distinct and wonderful. He’s building a church out of multiple generations from multiple cultures with multiple gifts to be His light and His representative in our North Waco community, right here on the corner of 25th and Mitchell. We are a church that works. The most unique thing about Ecclesia is that everyone, and I mean everyone, has a job. Its part of our DNA at ECC to believe that God has placed us in a church to use our gifts. And more than any other church that I've been a part of, our efforts, our energy, and our hearts go out to the people in our neighborhood, which fits well with our motto: "A diverse neighborhood community seeking Jesus Christ together." We’re not always perfect; in fact, sometimes we’re messy, and all the time we’re crazy, but if God has placed a heart in your chest that beats to serve the families of an urban neighborhood and honor Him through using your gifts, then serve and serve boldly. And we would be honored if you’d join us sometime for worship, and blessed if you choose to serve along side us. This banner, at the back of our worship space, is a reminder of who we strive to be as individuals and a community. We seek to be true disciples, following our Teacher in words and actions. We gather weekly to worship, then go out and try to walk closer with Jesus Christ every day. We aren't perfect. We are sinful and broken. Yet we strive every day to be better disciples of our Savior and Lord. 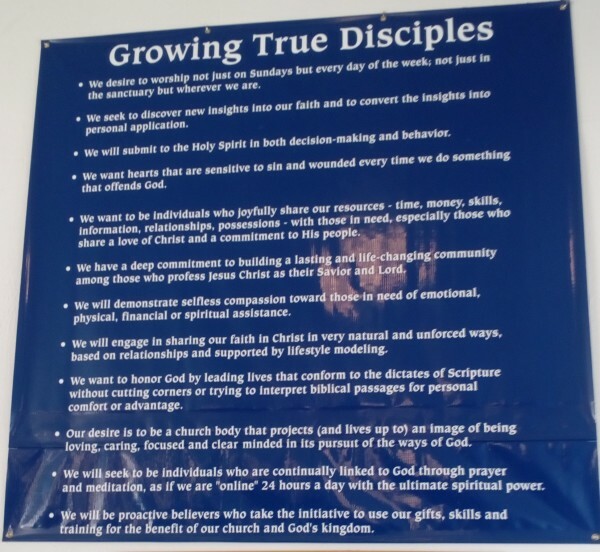 These twelve points summarize what we believe makes good disciples.